For shippers and receivers we are able to provide you with the link to all major international destinations. With our network of reputable shipping and forwarding companies located all over the world, you can be assured of fast and accurate delivery of your cargo. Our liner shipping service provides shippers and receivers a stable schedule that links Brunei with all the major ports around the world. 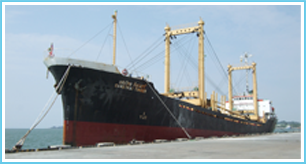 If you are shipping raw materials, commodities or specialised project cargo in bulk we can assist you to find the right vessel to transport your cargo.